Our Site is owned and operated by Memiah Ltd, a company registered in England under company number 05489185, registered VAT number 920805837, whose registered address and main trading address is at Building 3, Riverside Way, Camberley, Surrey GU15 3YL, trading as Happiful (“We/Us/Our”). We compile a monthly magazine featuring real-life stories, interviews and articles to help contribute to a happier, healthier, more sustainable society (“Magazine”). You may subscribe to the Magazine either in its downloadable PDF format (“Online Magazine”) or its equivalent hard copy print version (“Physical Magazine”). Access to both Magazines requires a subscription (“Subscription”). Subscription to the Online Magazine is free of charge, whereas there is a fee associated with Subscription to the Physical Magazine (further details of which may be found in Section 4 below). Access to Our Site is provided free of charge, “as is” and on an “as available” basis. We may alter, suspend or discontinue Our Site (or any part of it) at any time and without notice. We will not be liable to you in any way if Our Site (or any part of it) is unavailable at any time and for any period. If you would like to order a Magazine, Our Site will guide you through the subscription process. Before completing your order, you will be given the opportunity to review and amend it. Please ensure that you have checked your order carefully before submitting it. Subscriptions will start with the next available issue of the Magazine. Only once We have sent you an email confirmation of your Subscription will there be a legally binding contract between us and these Terms are part of it. Physical Magazine Subscription confirmations will include details of your Subscription, including its duration (including the start date and the renewal date) and fully itemised pricing including, where appropriate, taxes, delivery and other additional charges and, where applicable, estimated delivery dates. In the unlikely event that We do not accept or cannot fulfil your order for any reason, no payment will be taken under normal circumstances. If We have taken payment any such sums will be refunded to you as soon as possible and in any event within 14 days using the same payment method that you used when making the order. When you order a Subscription, the information you provide must be accurate and complete. If any of your information changes at a later date, it is your responsibility to ensure that you keep Us up-to-date. If We incur any costs as a result of your incorrect or incomplete information, We may pass those costs onto you. We will not be responsible for failure to deliver if the details you have supplied Us with are incorrect. We cannot guarantee that all of the content in our Magazines is appropriate for minors. If you are under 18 years of age, you must obtain your parent or guardian’s permission before ordering a Subscription and only view our content with their supervision. We currently charge £4.00 for each Physical Magazine ordered. We reserve the right to change prices and to add, alter, or remove special offers from time to time and as necessary. Changes in price will not affect any order that you have already placed (however please note Section 4.2 regarding VAT). Delivery charges are not included in the price of the Physical Magazine. For more information on delivery charges, please refer to Our Site. Delivery options and related charges will be presented to you as part of the order process. We accept payment by credit or debit card on Our Site. Payment (and related delivery charges) must always be made in advance. Your chosen payment method will be charged when we process your order and send you an email confirmation. If you purchase an ongoing subscription, you will be billed in advance before each delivery of the Physical Magazine. Please note delivery outside the United Kingdom will incur additional delivery charges. The Physical Magazine will normally be delivered on the dates specified in your email confirmation and, if you purchase a Subscription, We will continue delivering the Magazines until your subscription expires, or until it is ended either by you or Us. Delivery dates are approximate and time of delivery is not guaranteed. If We need to suspend delivery of the Magazine, We will inform you of the suspension and explain why it is necessary. No payment will be taken from you while delivery is suspended. If suspension lasts for more than 30 days, you may end your Subscription as described below in Section 7. Delivery shall be deemed complete once We have delivered the Physical Magazine to the address you have provided for delivery, or made the Online Magazine available for download. Ownership of the Magazine passes to you once we have received payment in full of all sums due (including any applicable delivery charges) for the Magazine. We want you to be satisfied with our Magazines and so we promise that they are of satisfactory quality, free from significant defects and are the same in all material respects as their description. We have made every reasonable effort to ensure that the Magazines conform to illustrations, photographs and descriptions provided in our sales and marketing literature. We don’t, however, guarantee that all descriptions, illustrations and/or photographs will be precisely accurate. If you discover that the Magazine does not meet this promise, you can either reject it within 30 days of receipt, or require Us to replace it, or (if we fail to do that) require us to refund the price (if applicable). This will only apply, however, if you have given Us a reasonable opportunity of examining the Magazine and returned it to Us at our cost, if requested. These rights do not apply if the defect is a result of normal wear and tear, misuse, abnormal storage, or intentional or careless damage. Subscriptions operate on an automated renewal basis. 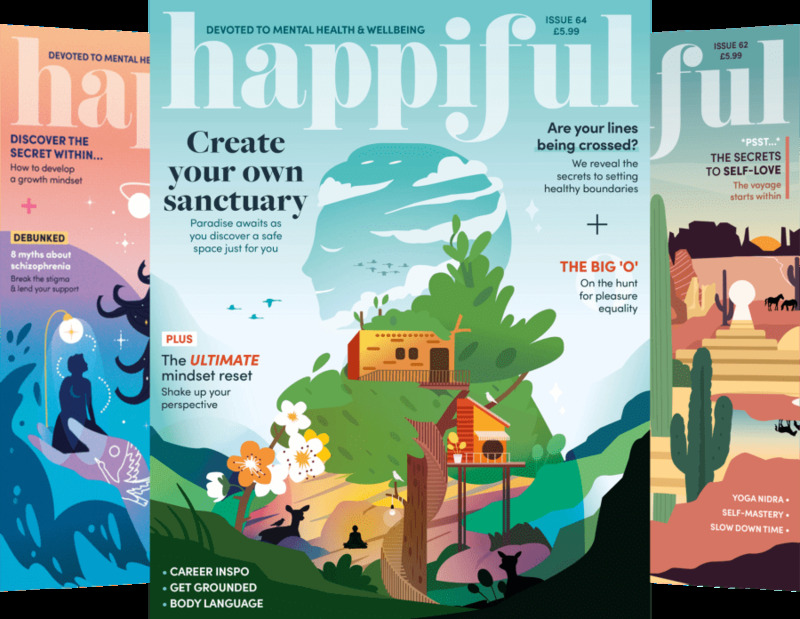 If you wish to end your Subscription, you may do so at any time in advance of the renewal date, online, or by contacting us at hello@happiful.com. Your cancellation will be effective as soon as We receive it and you will not be charged for any Physical Magazine that has not yet been dispatched. For the avoidance of doubt, You will continue to be charged for Physical Magazines on a monthly or annual basis until you end your Subscription. You may also cancel your subscription (if it is placed with us online) within 14 days of receipt of the first delivery of your Physical Magazine. If you have already paid for the Physical Magazine, the payment will be refunded to you within 14 days of your cancellation (including delivery costs). You agree that this cancellation right does not apply to any Subscription to the Online Magazine where you have authorised us to download that digital content to you prior to the expiry of such 14 day period. Please note that the right to cancel during this 14-day period does not apply to purchases of single issue magazines. We may cancel your Subscription at any time, including if we no longer have sufficient stock, if the Magazines have been discontinued, or for any event outside our reasonable control. You will be refunded in full for any Magazines paid for that you have not yet received or will not receive due to cancellation. All Content included on Our Site and in Our Magazines (including any and all text, images, audio, video, software, databases and any other information that appears on, or forms part of, Our Site and Magazines) and the copyright and other intellectual property rights subsisting in that Content (“Our Content”), unless specifically labelled otherwise, belongs to or has been licensed by Us. Our Content is protected by applicable United Kingdom and international intellectual property laws and treaties. You may access and use Our Content for personal, non-commercial purposes but a Subscription does not give you any rights in Our Content. You may not reproduce, copy, rent, distribute, sell, publish, republish, sublicense, share, broadcast or otherwise transmit or exploit Our Content or make it available to the public unless given express written permission to do so by Us. If you wish to use Our Content in any way that is not permitted under these Terms, please contact Us at hello@happiful.com. You may not use Our Content for commercial purposes without first obtaining a licence from Us (or our licensors, as appropriate) to do so. This does not prohibit the normal access, viewing and use of Our Site for general information purposes whether by business users or consumers. Our status as the owner and author of Our Content (or that of identified licensors, as appropriate) must always be acknowledged. You are welcome to submit articles that you feel may be appropriate for inclusion and publication in an edition of our Magazine. User Content on Our Site includes (but is not necessarily limited to) articles, stories and comments on articles/stories published on Our Site or in our Magazine, created and submitted by users of Our Site. You agree that you will be solely responsible for your User Content. Specifically, you agree, represent and warrant that you have the right to submit the User Content and that all such User Content will comply with Our Acceptable Usage Policy, detailed below in Section 10. You agree that you will be liable to Us and will, to the fullest extent permissible by law, indemnify Us for any breach of the warranties given by you under Section 9.2. You will be responsible for any loss or damage suffered by Us as a result of such breach. You retain ownership of your User Content and all intellectual property rights subsisting therein. When you submit User Content, however, you grant Us an unconditional, non-exclusive, fully transferable, royalty-free, perpetual, worldwide licence to use, store, archive, syndicate, publish, transmit, adapt, edit, reproduce, distribute, prepare derivative works from, display and sublicense your User Content for inclusion in our Magazines and Our Site and for the purposes of operating and promoting Our Content (including via social networking sites affiliated with Our Site and Magazines). We may reject or remove any User Content from Our Site or Magazines where, in Our sole opinion, it violates Our Acceptable Usage Policy, or if We receive a complaint from a third party and determine that the User Content in question should be removed as a result. Please note that We are not required to moderate any User Content and We will not be responsible for any loss to anyone who does not use Our Site according to the standards set out in Our Acceptable Usage Policy below (whether or not we have moderated the service). You may not link to Our Site from any other site the content of which contains material that is contrary to our Acceptance Usage Policy above. Links to other sites may be included on Our Site and in Our Magazines. Unless expressly stated, these sites are not under Our control. We neither assume nor accept responsibility or liability for the content of third party sites. The inclusion of a link to another site on Our Site or in Our Magazines is for information only and does not imply any endorsement of the sites themselves or of those in control of them. We may feature advertising on Our Site and in Our Magazine. We are not responsible for the content of any advertising on Our Site or Magazine including, but not limited to, any errors, inaccuracies, or omissions. We do not accept liability for products and/or services offered by third parties. The opinions, views, and values expressed in Our Content and in User Content are those of the authors of that Content and do not necessarily represent Our opinions, views, or values. Nothing on Our Site or in our Magazines constitutes advice on which you should rely. It is provided for general information purposes only. We make reasonable efforts to ensure that Our Content is complete, accurate, and up-to-date. We do not, however, make any representations, warranties or guarantees (whether express or implied) in this respect. To the fullest extent permissible by law, We accept no liability to any user for any loss or damage, whether foreseeable or otherwise, in contract, tort (including negligence), for breach of statutory duty, or otherwise, arising out of or in connection with the use of (or inability to use) Our Site or the use of or reliance upon any of Our Content. To the fullest extent permissible by law, We exclude all representations, warranties, and guarantees (whether express or implied) that may apply to Our Site or Our Content. We accept no liability for loss of profits, sales, business or revenue, goodwill or reputation, or for any other indirect or consequential loss or damage and Our total legal responsibility to you will not exceed the price you have paid for any Subscription over the previous 6 months. We will not be legally responsible to you for failure or delay in carrying out our obligations which is caused by an event beyond our reasonable control, which we could not have foreseen or which was unavoidable. This includes industrial disputes, energy or transport failures, acts of God, war, terrorism, civil unrest (such as riots), explosions, mechanical breakdown, natural disasters, deliberate damage, or being let down by suppliers or sub-contractors. We exercise all reasonable skill and care to ensure that Our Site is free from viruses and other malware, however, We accept no liability for any loss or damage resulting from a virus or other malware, a distributed denial of service attack, or other harmful material or event that may adversely affect your hardware, software, data or other material that occurs as a result of your use of Our Site (including the downloading of any Content from it) or any other site referred to on Our Site. We neither assume nor accept responsibility or liability arising out of any disruption or non-availability of Our Site resulting from external causes including, but not limited to, ISP equipment failure, host equipment failure, or communications network failure. You are responsible for protecting your hardware, software, data and other material from viruses, malware, and other internet security risks. You must not deliberately introduce viruses or other malware, or any other material which is malicious or technologically harmful either to or via Our Site. By breaching the provisions of Section 16.2 to 16.4 you may be committing a criminal offence under the Computer Misuse Act 1990. Any and all such breaches will be reported to the relevant law enforcement authorities and We will cooperate fully with those authorities by disclosing your identity to them. Your right to use Our Site will cease immediately in the event of such a breach. Use of Our Site is also governed by Our Cookie and Privacy Policies, available from happiful.com/privacy and happiful.com/cookiepolicy. These policies are incorporated into these Terms by this reference. We may use your personal information to provide Our Content, process your Subscription and reply to any communications you send to Us. We will only pass on your personal information to third parties where we use such third parties to carry out certain functions on our behalf in relation to your order (e.g. third party payment providers). These parties are also bound by GDPR, or if outside the UK, an appropriate and EU-compliant data processing agreement, and should use and hold your personal information accordingly. If We have your contact details, We may from time to time send you important notices by email. Such notices may relate to matters including, but not limited to, service changes and changes to these Terms. We will never send you marketing emails of any kind without your express consent. If you do give such consent, you may opt out at any time. Any and all marketing emails sent by Us include an unsubscribe link. If you opt out of receiving emails from Us at any time, it may take a reasonable period of time for your new preferences to take effect. We may alter these Terms at any time. Any such changes will become binding on you upon your first use of Our Site after the changes have been implemented. You are therefore advised to check this page from time to time. To contact Us with any queries about these Terms or the content we provide, please email Us at hello@happiful.com. These Terms contain the whole agreement between You and Us. We are allowed to transfer our rights and responsibilities under these Terms to third parties, for example by assignment or subcontracting but you are not permitted to do any of these things. Delay in exercising a right under these Terms will not take away that right or any other right. Nobody other than We and you may rely on any of these Terms. If any court decides that any part of these Terms are invalid or may not be fully enforced, the rest of these Terms will remain valid and enforceable. These Terms will be interpreted in accordance with English law. If there are any disputes they may only be dealt with by the courts of England and Wales.